Experience nature right up close on a 4x4 day safari and river cruise at Chobe National Park. You'll follow an expert guide on a 10.5-hour journey into this incredible landscape and see crocodiles, hippos, birds and elephants. 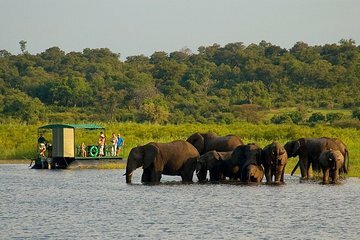 Cruise along the scenic Chobe River, then spend an afternoon on an open 4x4 safari looking for some of Africa's Big 5. Round-trip hotel transfer, lunch and refreshments are included in this memorable day outdoors. Your friendly professional guide will collect you from you hotel and transport you to Botswana's Chobe National Park. The 45-minute drive winds through scenic African landscapes and Zambezi National Park. Keep your eyes open for wildlife, including giant elephants, which call this part of the world home. Your guide will assist you with immigration at the Zimbabwe-Botswana border before you head to the Chobe River Jetty for a three-hour game cruise. You'll have the chance to spot, hippos, crocodiles, elephants and more along the shores of this picturesque river. Enjoy refreshments on board your boat as you gaze out over scenic landscapes. When your cruise is finished, make your way to lunch at the Chobe Safari Lodge (or similar) before heading into the bush on an open 4x4 vehicle. You'll have a chance to spot eland, sable, elephant, leopards and more with the help of your guide. Return to the border around 5pm and complete formalities before returning to your accommodation by about 6 pm. Overall it was all good day. Litlle problems with safari car at first but after 20-30 min waiting time everything went well. Guides were nice and very friendly. Game drive was the best, after that river cruise was not so amazing but we saw hippos so it was fine experience also. We had children 9 and 11 yeats and the day was good to everyone.